Algerian President Abdel Aziz Bouteflika has ordered 42 private French-language schools to be closed for "linguistic deviation," Le Figaro reports. Algerian police have been told to enforce a presidential decree that stated that "any private institution which does not give absolute priority to the Arabic language is bound to disappear." The policy is revival of Algeria's policy of forcing state schools to abandon French, once the linga franca of education, in favor a more "Arabo-Islamic" education. This pit Arab conservatives against the substantial Berber majority and Arab secularists -- the first who worried that their children would not learn Berber in schools, the latter who saw the hands of Islamists once close to the state behind the move. The irony of that for much of the elite that is supporting these decisions, private schools were French is taught are where their children are being educated. There is widespread concern that the forced Arabic-language instruction is creating children who are "illiterate in two languages." This is because, partly, of the quality of Arabic-language instruction (Algeria does not have enough qualified Arabic teachers and must import teachers from Egypt and elsewhere), and because French remains the language of the business elite. Meanwhile, public sector university professors' syndicates have called a national strike to demand pay increases, meaning not many Algerian kids are going to school these days. The text adopted by the government puts them [security personnel] beyond the reach of legal pursuits, even if infractions have been committed. They have "shown proof of patriotism," and "no lawsuit can be made, individually or collectively," against them. 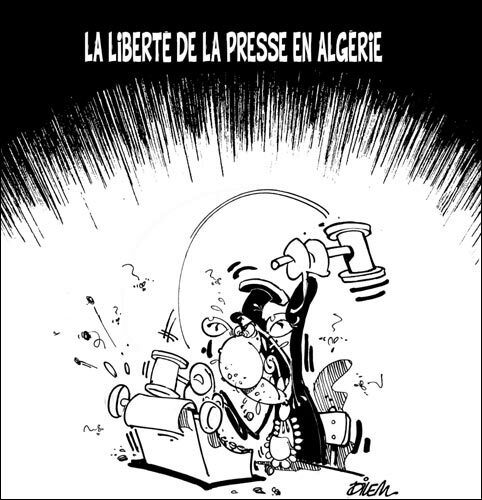 "Any denunciation or complaint regarding [security personnel] will not be accepted," the documents adds, while adding that "any declaration, written or otherwise, using or instrumentalizing the wounds of national tragedy to attack national institutions, weaken the state, damage the honor its agents... or to sully the image of Algeria internationally" will be sanctioned.